When the Skin's Too Small It's Time To Shed It All! 1 This morning I put on one of my favorite old shirts. Then, I noticed something strange. The arms were too short. The top was too tight. I could see my belly button. Yikes! What happened to my shirt? Had it shrunk? Nope, I had grown. I had grown too tall for my favorite top. Growing taller is great! But it does present one problem. When we grow, many of our clothes don't fit anymore. Did you know that snakes have this problem too? They don't outgrow their shirts (because they don't wear any! ), but they do outgrow their skin. 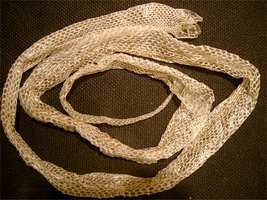 2 A snake's skin is made up of layers of scales. These scales are made of keratin. Your fingernails are made out of keratin, too. As a snake grows, new layers of scales begin to form. When the new scales are ready, it is time for a snake to shed its old skin. Feedback on When the Skin's Too Small It's Time To Shed It All!